The club are delighted to announce the return of the annual J.W. Smyth Christmas cookery demonstration. This year, Rachel Allen will be the special guest, it promises to be a great night as always with complimentary cheese and wine reception on the night. The event will take place on Thursday, 23rd November at 7.30pm. 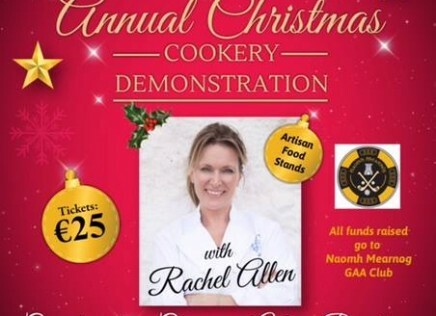 Tickets for the cookery Demonstration are now available, they cost €25 and can be bought online, from JW Smyth Family Butchers Portmarnock or from Kay Cormican, Donal Power, Sheila Waters or Eileen Bernard in the Club Shop or on Saturday mornings in the coffee shop. Tickets are selling fast so don’t miss out.